Take a big bowl add rawa , 2 tbsp oil & mix well. Add yoghurt , all the vegetables,turmeric powder & mix well. Add water & make a mild thick batter. Heat oil in a pan,Temper with mustard seed, chopped green chillies, grated ginger & add to the batter. 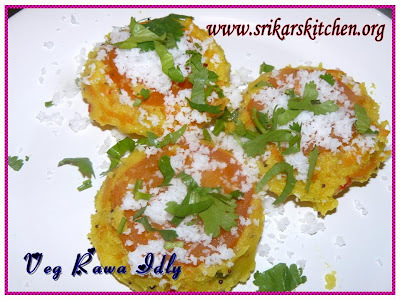 Grease oil in a idly plate, arrange the tomato & add the idly mix. Pressure cook (with out using whistle) for around 6- 7 mins. Garnish with coconut & cilantro & Serve with any kind of chutneys. What a neat idea, Sri! Veggies, rawa, steamed up - yum! Adding turmeric makes it look exotic too. Wow that looks colorful. Healthy and yummy recipe. Rava idly with vegetables looks simply superb Sri! I've never used ENO for rawa idli. Loads of goodies gone into these idlia. They look delicious. That is a cool perked up version of the regular kind. Makes it look so colorful. ENO in rawa Idli sounds greats. i cannot wait to try it. looks so nice,will sure add veggies next time and see! Wow, I am being tempted today, looks awesome!